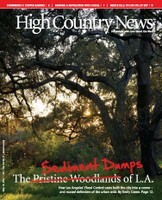 LA’s improbable relationship with the San Gabriel Mountains makes the cover story High Country News: The list price was $1.125 million in August 2011, when Sotheby’s International Realty held the first open house for 1674 Highland Oaks Drive, in the Los Angeles suburb of Arcadia. Scented candles burned, classical music played and the air conditioner ran as potential buyers milled through the home’s three bedrooms, living room and combination den/dining room. Through sliding glass doors, a pool was visible in the rear garden; beyond it stood a sharply trimmed hedge. Past the hedge, in the ravine below it, a deep wash lay. Metropolitan Los Angeles ends at the edge of this canyon property, and above the wash, its steeply upland collar of national forest begins. 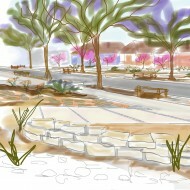 Once, like all the canyons threading the foothills of the San Gabriel Mountains, Santa Anita Wash had a stream tumbling through it, lined with coast live oaks, sycamores and mountain mahogany. 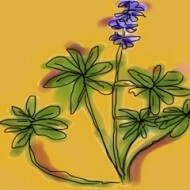 In the dappled light of the understory grew coffee ferns, delphinium, phacelia, monkeyflowers. Bears gorged on blackberries while scrub jays jealously cached acorns. By day, the canyon was atwitter with finches and bushtits, and at night, the tree frogs and crickets chorused. The dams and debris basins strung along the San Gabriel foothills, forming what Flood Control historian Jared Orsi describes as a "Maginot line" around the LA basin, are choked with mountain sediment. A 15-month review of what to do with it is online at the LA Department of Public Works. 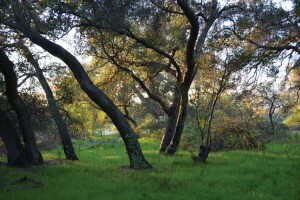 Until January 2011, a favored option was felling pristine oak woodland, called only "native vegetation" by Flood Control engineers, for conversion to dumps. Public comment on other options for disposal of the sediment is due by May 30th. 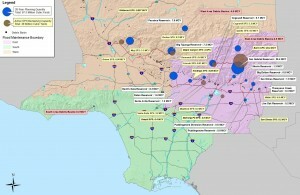 Click on the map to be taken to the LA County Department of Public Works' draft sediment management 20-year strategic plan. But on the day of the open house for what Sotheby’s called its “Highland Oaks Beauty,” there was no wild swell of twittering. No frogs, no crickets, no sign of a creek. 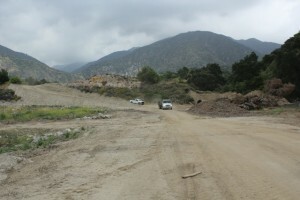 The roughly 200 acres of sun-bleached concrete, gravel and sand in the canyon below resembled some kind of quarry. In a sense, that’s what it was — a pit gradually gouged out of the woodland over the last 85 years in an ongoing struggle to contain the mountains. Click here to keep reading the High Country News story on how the felling of the Arcadia oak woodland behind Highland Oaks Drive forced a public 15-month-long review of LA County’s plans for disposal of sediment from behind its 14 dams and 162 debris basins. If you don’t have a subscription to this excellent non-profit environmental report, please consider signing up for a 30-day free online trial. A six month online subscription is only $12. Below is a Joshua Link photo of the Arcadia woodland before felling, along with a photo of mine taken in May 2011, almost five months after the razing of the woods to enlarge a Flood Control District sediment dump. I would like to complement you on what I considered an exceptional article in HCN on LA’s flood control issues. I was born in Wyoming and am a retired civil engineer, as you probably can tell from my spelling. My wife and I live in Reno. I was involved in the proposed Las Vegas Pipeline issue in particular its effect on local communities. I am glad you recieved an award for your efforts.